I'd say "just like Mom used to make," except my mom never did much cooking due to chronic illness. Incidentally, the date I'm composing this blog post is the one year anniversary of my mother's memorial service. I don't mean to be a Debbie Downer, but the past couple weeks have been one of those stretches in life that calls for some home-cooked (or at least home-cooked-esque) chicken soup for the body as well as the kind for the soul—just in time for my annual spring cold, too. 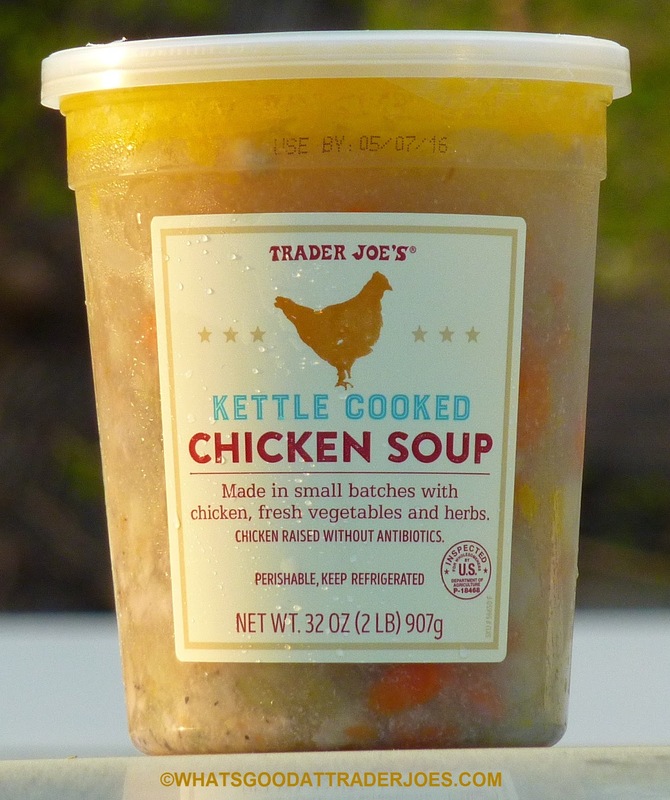 We bought this soup before my little bug set in, and it's almost like my body got sick on purpose just so it could be soothed by this kettle-cooked container of chicken cheer. I'm not sure about the logic of using a plastic tub for this product, as opposed to a can or a glass jar of some kind. I'm not complaining. It just seems unusual to me, especially since they're going for that home-cooked angle. At any rate, it's unique. As you open the packaging, little globs of chicken stock stick to the plastic safety seal under the lid in a rather unappetizing way. But once you get past that, what lies beneath seems much more inviting. At first glance, the soup looks nice and chunky. There are decent-sized pieces of both white and dark meat chicken—and not like weird disc-shaped pieces or perfect cubes either, as one may find in other "chunky" soups. These little angular pieces of chicken look like shapes that might have actually been carved by human hands. Or maybe TJ's is employing robots that can realistically imitate the beautifully imperfect slashes and slices you might find in a cauldron of homemade soup. Either way, I like it. Also, there are plenty of carrot, parsnip, celery, and onion bits, too—with an emphasis on the carrots. The broth is nice and sea-salty, but not overly so. 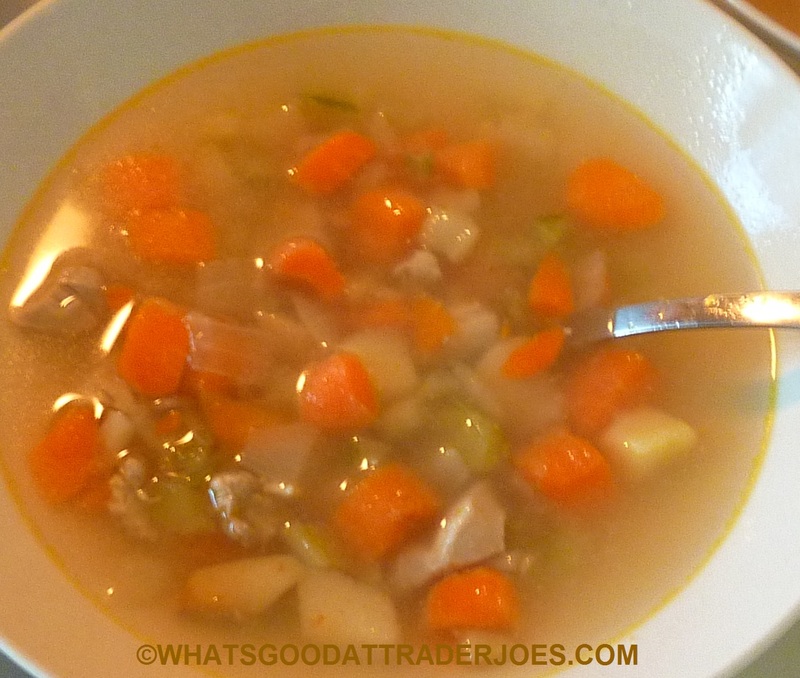 It's flavorful, and it blends well with the other ingredients, although it could almost stand alone as a soup just by itself. A delicate medley of herbs, including garlic, parsley, pepper, thyme, and bay leaves, rounds out the taste of this impressive down-home delicacy. 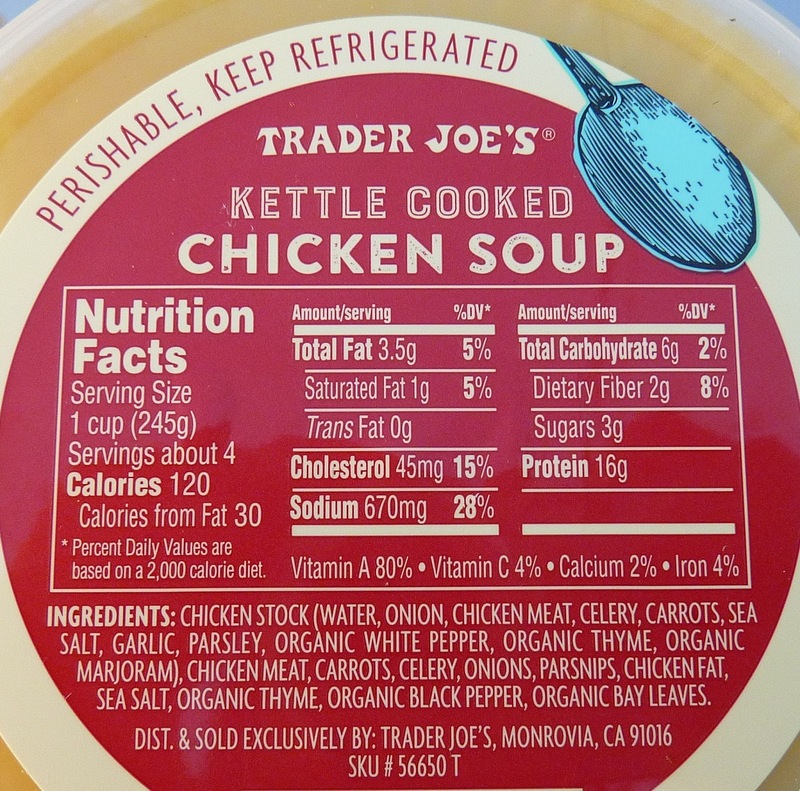 I wouldn't have minded a little more chicken in the soup, but honestly, compared to any other chicken soup I've ever had, this product delivers at least as much of the palatable poultry. So no complaints here. Four and a half stars from me. Four and a half from Sonia, who adds, "This is like really good deli soup." She's not wrong. I like that it's in the plastic quart (or see through) container as opposed to can. That is more homemade. 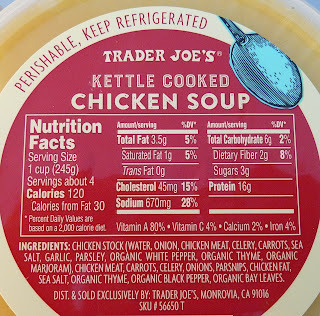 I make soup of all kinds often, including chicken noodle. If you are making it properly, and filling to the top, there will be recidual on the lid, which makes it more athentic to me. Curious about the shelf life on this. I have to admit, I've been tempted to buy much of thier refrigerated ready mades but knowing it's made somewhere, shipped in, and sits on a shelf for unknown time kind of freaks me out. It kinda screams to have matzo balls added in. Also the ingredients is very simple like you will find in a home kitchen not like other processed soups. I like the idea of having it without pasta or rice to allow cooks to add in. Yeah we liked the simple ingredients too. And yes, rice or noodles would be great add-ins. What's the price on this? And how does it compare to TJ's other premade chicken soup (non-refrigerated, in the cardboard box)? I've had the boxed soup, which has a good amount of chicken and thick noodles. There has to be a preservative in it. I bought it around the first of October and it doesn't expire until 10/26. Makes me a little nervous.